I was able to say to Pierre Berton once that a good historian and a good writer did not always come in the same body. He laughed and agreed. 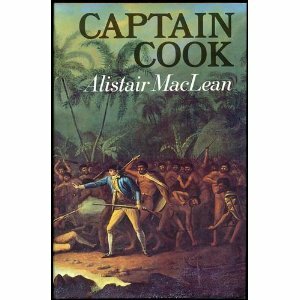 Which is why when I ran across a biography of Captain Cook by Alistair MacLean I snapped it up. MacLean, you will remember, was a Scots thriller writer of The Guns of Navarone and Where Eagles Dare fame (although my two MacLean favorites were, well, are South by Java Head and When Eight Bells Toll). Maybe MacLean’s historiography wouldn’t be the most perfectly researched — or maybe it would — but I figured anyone who could write a line like “I hoisted a cautious eye over the sill of the wheelhouse door” could be relied upon to write an entertaining account of the life of Captain James Cook. It is a quite staggering reflection that when Cook left Canada for the last time in 1767, he was still a non-commissioned officer. It is also a staggering reflection on the Lords of the Admiralty of the time that, because of their innate snobbish conviction that officers and gentlemen are born and not made, Cook did not quite qualify for a commission. He had been in the despised Merchant Service, he had sailed before the mast in the Navy, he was poor and his origins were obscure. There could have been little doubt left in the Admiralty by that time that in Cook they had the greatest seaman, navigator and cartographer of the generation. But a commission? Hardly. Hardly, that is, until they realised that to send a naval vessel to circumnavigate the globe, in the greatest exploratory voyage ever undertaken, under the command of a non-commissioned officer wouldn’t be quite the thing to do. For one thing, it would redound most dreadfully upon the alleged competence of those who did hold commissions, and, for another, it would not look good in the history books. So, belatedly, they made him a lieutenant. Convinced? I thought so. MacLean‘s tart tongue is one of the best things about this biography, it is almost as if when reading this book you were sitting in the back of a classroom listening to the best history teacher you ever heard talk about his favorite subject in the world and moreover one that he knows backward and forward. I’ve read a few other biographies of Cook, notably Tony Horwitz’s Blue Latitudes, and I think MacLean knows his Cook stuff. Better yet, he knows how to write. Highly recommended. Just for fun, here’s the trailer for the Richard Burton-Clint Eastwood film of Where Eagles Dare. Watch that first step.